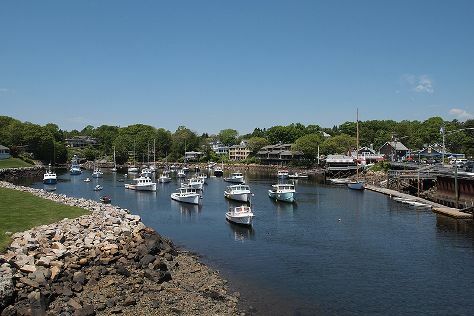 Explore Ogunquit's surroundings by going to Portland Head Light (in Cape Elizabeth), Old Port (in Portland) and Old Orchard Beach (in Old Orchard Beach). There's lots more to do: get to know the fascinating history of Marginal Way Walkway, kick back and relax at Long Sands Beach, enjoy the sea views from Cape Neddick Nubble Lighthouse, and take in the architecture and atmosphere at St. Ann's Episcopal Church. To find where to stay, reviews, and more tourist information, read Ogunquit trip planner . Oklahoma City to Ogunquit is an approximately 9.5-hour combination of flight, taxi, and bus. You can also do a combination of flight and bus; or drive. The time zone difference when traveling from Oklahoma City to Ogunquit is 1 hour. Plan for slightly colder temperatures traveling from Oklahoma City in July, with highs in Ogunquit at 81°F and lows at 58°F. Wrap up your sightseeing on the 29th (Mon) to allow time to drive to Boothbay Harbor. Boothbay Harbor is a town in Lincoln County, Maine, United States. Start off your visit on the 30th (Tue): take in nature's colorful creations at Coastal Maine Botanical Gardens and then head off the coast to Cabbage Island. To find ratings, maps, and other tourist information, go to the Boothbay Harbor trip itinerary planner . You can drive from Ogunquit to Boothbay Harbor in 2 hours. Other options are to do a combination of taxi and bus; or do a combination of train and taxi. Expect a daytime high around 79°F in July, and nighttime lows around 59°F. Cap off your sightseeing on the 30th (Tue) early enough to go by car to Bar Harbor. Bar Harbor is a town on Mount Desert Island in Hancock County, Maine, United States. Kick off your visit on the 31st (Wed): look for all kinds of wild species at Shore Path, stop by Fiore Artisan Olive Oils and Vinegars, and then take your sightseeing to a higher altitude at Cadillac Mountain. On the next day, don't miss a visit to Land Bridge to Bar Island, then explore and take pictures at Park Loop Road, and then head off the coast to Mount Desert Island. To see traveler tips, ratings, other places to visit, and more tourist information, use the Bar Harbor trip planner . Traveling by car from Boothbay Harbor to Bar Harbor takes 3 hours. Alternatively, you can do a combination of taxi and bus; or do a combination of taxi and bus. In July, daily temperatures in Bar Harbor can reach 75°F, while at night they dip to 58°F. Cap off your sightseeing on the 1st (Thu) early enough to go by car to Camden. Camden is a town in Knox County, Maine, United States. Kick off your visit on the 2nd (Fri): take in the awesome beauty at Mount Battie and then learn about winemaking at Cellardoor Winery. To see ratings, where to stay, and tourist information, read our Camden trip planning site . Traveling by car from Bar Harbor to Camden takes 2 hours. Alternatively, you can take a bus. In August, daily temperatures in Camden can reach 74°F, while at night they dip to 56°F. Finish up your sightseeing early on the 2nd (Fri) so you can travel back home.